WHY IS the Mirror such a good boat? Why is it appreciated by all ages? Why is it appreciated by the young as much as the old, by those sho never wish to race as well as Olympic medallists? (Commander Graham Mann, who won a Bronze medal in the 1956 Olympic Games in Melbourne. 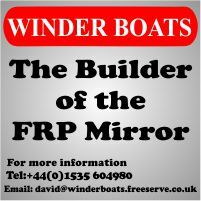 is an “afficionado” of the Mirror and has built two boats). I have sailed them myself and have absolutely no ambition to race but much prefer pottering and ditch crawling (if the River Thames qualifies as a ditch!) My eldest son only wishes that we would buy one instead of sailing other peoples! 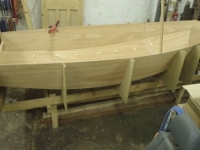 I think the first part of (he answer is in the knowledge of Jack Holt who for many years has specialised in designing boats for everyone. Typical of his earlier boats are the GP 14 and the International Enterprise. He, with Barry Bucknell, on the Short Cuts television programme, built Enterprise 1300 which I was lucky enough to own. Later Jack and Barry teamed up to design the Mirror. Jack’s boats are multi-purpose. If you know him, as I am fortunate enough to know him, you will appreciate that he has probably done more than any other single person in this country to bring sailing within everyone’s pocket. The second part of the answer is undoubtedly because the Mirror is as true a one-design as can be found. This not only means that those racing have equal opportunities, one with another, but, more important. mass production can he achieved thus keeping the costs down. Like Jack’s boats, the RYA is “multi-purpose”. An Association with a subscription which was £2.2s.Od. in 1875 and is now only £3.00. By any standards this means that the subscription rate has actually gone down over the years. What does this Association accomplish? It handles many problems common to all boat owners. For instance, it helps the deep-sea cruising boat-owners and the Mirror cruising boat owner. The usual questions about the RYA are: What is it? What does it do? What do I get out of it? The full name is the Royal Yachting Association. Her Majesty the Queen graciously granted us “Royal” status not to he exclusive, hut because of the work we had accomplished for all who have an interest in boats. There are many thousands of acres of usable inland water, and it needs organisation to get these acres used. The RYA was involved in the early stages in getting sailing on Weir Wood, Island Barn, Queen Mary. Draycote, Bough Beech. Grafham Water, King George, Derwent Reservoir and still is involved especially in negotiations on RYA Regional Sailing Centres - Datchet and Empingham. It is a good record but we are working on a national plan to obtain far more water for sailing and a National Yacht Racing Club to teach racing, and improve standards of seamanship. Around the coast, the RYA annually investigates over 250 coastal buildizig projects to ensure that they have no adverse affect on pleasure boating. The RYA’s major aim is to make boating possible for everyone. We want everyone, not only to be able to purchase a boat which suits his pocket but also to enjoy this on the water without frightening himself or herself silly or being an accident statistic for the Coast Guard or RNLl. To achieve this we now have a senior National Sailing Coach in England and Wales, a National Sailing Coach for Scotland, 300 coaches, 2,000 instructors and 190 RYA recognised training establishments. Special sailing holidays at reduced prices are available to RYA members. For instance, at Ravens Alt near London there is sailing instruction available for all ages and experience and at the Island Cruising Club in Salcombe you can spend up to two weeks sailing a variety of different boats belonging to the club. If you want to go sailing locally and you want to know where to put your boat in the water, or you are going on holiday and taking your boat, the RYA can advise you about finding the numerous launching sites which are available throughout the United Kingdom. Only a few years ago, when (railing a boat you were restricted to 30 m.p.h., this not only inconvenienced those who were towing the boat but all the other people on the road who were held up because they could not pass. Due to our representations, amongst others, the speed was raised to 40 m.p.h. and has recently been raised again to 50 m.p.h. We have an information service available to members which is used by thousands of yachtsmen every year. Many people want to know how they should proceed when taking their boats on holiday to the Continent. One question a little while ago was on how to conduct a burial at seat.. We publish some 25 booklets which are available free of charge to members, each of which is filled with authoritative information. Everyone who races should definitely be an RYA member. You are racing under the RYA rules which have been adopted by every club in the country. Although the rules permit clubs to settle any protests which arise, those who are dissatisfied with the protest committee’s decision are able to apply to the RYA for interpretation of the rules. The RYA is conducting a drive to increase its membership We must have the support of all sailors if we are truly to represent them. Take advantage of the Association, its magazines, booklets, information service, etc. and see if you do not think at the end of a year that you have had your moneys worth. I will be delighted to enrol you as a full member. Post it to: Royal Yachting Association, 5 Buckingham Gate. London, S.W.1. This article is from Reflections No. 11 Autumn 1973, page 3, and has been captured by OCR, so typos & errors are possible.